All Jessica Nelson wants to do is brighten your day. That may seem like a tall order for the 16-year old Tracy area resident due to recent events, but a radiating smile and bubbly laughter make it hard not to feel positive in her presence. One might think Nelson - Jessie - would have a different attitude on life since July 8, 2014. 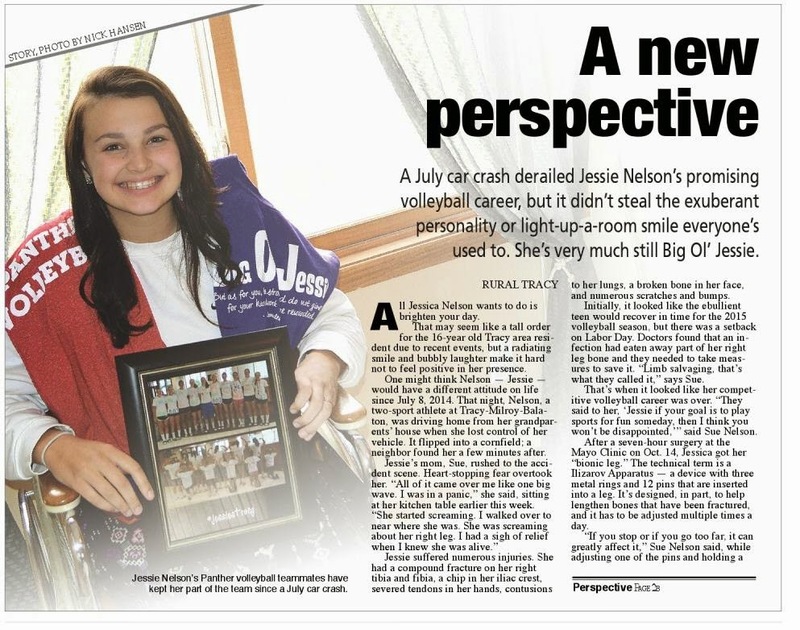 That night, Nelson, a two-sport athlete at Tracy-Milroy-Balaton, was driving home from her grandparents' house when she lost control of her vehicle. It flipped into a cornfield; a neighbor found her a few minutes after. Jessie's mom, Sue, rushed to the accident scene. Heart-stopping fear overtook her. "All of it came over me like one big wave. I was in a panic," she said, sitting at her kitchen table earlier this week. "She started screaming. I walked over to near where she was. She was screaming about her right leg. I had a sigh of relief when I knew she was alive." Jessie suffered numerous injuries. She had a compound fracture on her right tibia and fibia, a chip in her iliac crest, severed tendons in her hands, contusions to her lungs, a broken bone in her face, and numerous scratches and bumps. Initially, it looked like the ebullient teen would recover in time for the 2015 volleyball season, but there was a setback on Labor Day. Doctors found that an infection had eaten away part of her right leg bone and they needed to take measures to save it. "Limb salvaging, that's what they called it," says Sue. That's when it looked like her competitive volleyball career was over. "They said to her, 'Jessie if your goal is to play sports for fun someday, then I think you won't be disappointed,'" said Sue Nelson. After a seven-hour surgery at the Mayo Clinic on Oct. 14, Jessica got her "bionic leg." The technical term is a Ilizarov Apparatus - a device with three metal rings and 12 pins that are inserted into a leg. It's designed, in part, to help lengthen bones that have been fractured, and it has to be adjusted multiple times a day. "If you stop or if you go too far, it can greatly affect it," Sue Nelson said, while adjusting one of the pins and holding a white sheet of paper with rows of three digit numbers that show where each pin needs to be adjusted and when. "You have to be vigilant with this whole thing," she adds. Jessie has become used to the tinkering with leg. She sits in her wheelchair smiling while her mom adjusts one of the pins. Nearly four months after the crash, she treats it as if it was just another high school event. She scrolls through her Instagram feed on her phone which has numerous pictures of her time at the hospital. She explains the complex healing process of her leg like it was a physics equation. However, unlike most other high schoolers, she's not self conscious about her new device. "Should my leg be in it?" she asks when setting up for a photo. Before the crash, volleyball took up most of Jessie's life. She played year-round and would save her money to take part in summer camps. This summer she wanted to go to the Intermediate Camp at Southwest Minnesota State so badly that she told SMSU coach Terry Culhane that she'd switch from her normal position as a hitter and go as a libero, not an easy switch for someone who is six-feet tall. "She had such a passion for volleyball. She played exhibiting that passion and energy," said TMB assistant volleyball coach Rick Haberman. "She played displaying that love of volleyball." Haberman gave her the nickname "Big Ol' Jessie" in ninth grade. Even though Nelson hasn't been on the court, she's still very much on the minds of the TMB volleyball community. Her teammates put a poster on her locker before every home game. The school's public address announcer, Jim Miller, announces Nelson's name before every game. Volleyball players from other teams have shown their support as well, and numerous Panther fans have worn "Big Ol' Jessie" T-shirts at matches throughout the season. The shirts were part of a fundraising effort. They are purple, Jessie's favorite color, and have her favorite Bible verse on them. It's from 2nd Chronicles: "But as for you be strong and do not give up for your hard work will be rewarded." Her team visited her in the hospital a few days after the crash. They had just returned from a camp at the University of Wisconsin. They wore homemade shirts that said "We love you BOJ" and presented her with an autographed volleyball that they got members of the Wisconsin volleyball team to sign for her. "It was very emotional. I was very happy to see her," said teammate Sara Stoneberg. "I cried a little bit. The second I saw her in the room I hugged her. I wasn't thinking volleyball at that moment. I was thinking about how she was still alive." Jessie said it was one of her favorite days of the last few months. She still follows her team closely. She furiously tried to get updates during the Panthers' recent game against the Marshall Tigers. "I was texting three different people. I couldn't get the online stream to work," she said. The Panthers ended up winning, beating the Tigers for the first time in over a decade. Jessie's time is now mostly spent going to doctor appointments, being involved with her church youth group and catching up with homework. Sue Nelson said it's been an adjustment for both of them. Jessie said her biggest challenge has been answering the same questions over and over about her leg. However, she says she has gained perspective from the crash. "You've got to know if something did happen, you have to know what to do. Say you're an athlete, and you got that taken away from you. How are you going to look at it? I can look at it that it's so horrible that I can't play anymore. Or I can look at it, now that I can't play volleyball, 'I can do this. A door has been opened,'" she says while fiddling with an Evian water bottle. One door that has been opened for Jessie is her career path. She now wants to become a registered nurse. "My life would have been completely different if this hadn't happened. It would have been sports, volleyball especially. I hopefully would have gone to a decent school on a volleyball scholarship. I would have gone for culinary or design school," she says. She's relieved to have found some clarity through all that has happened to her. "I'm glad I now have more of a plan of what I am going to do," she said. The medical professionals who assisted her encouraged Jessie to consider nursing in her future. However, she made it clear she wants to work with children, because nurses in that field "don't just do what they have to do and go home. They want to brighten your day," she said, with a smile, of course. Saturdays are different for Alex Fenske these days. He doesn't put on his football pads. He doesn't warm up with the University of St.Thomas football team. He doesn't play in the games. He waits on the sidelines. The 2012 Marshall High school graduate was slated to start for the Tommies at quarterback this season, but that all changed after a preseason injury. Fenske's upper body went the opposite way of his foot after a tackle during a scrimmage against a junior college team. He didn't know what to think after he went down on the turf. "A million things went through my head. It was a sensation that I've never felt before. I felt something pop. I didn't know if it was an ACL or a tear. It happened so quick," he said. That injury forced Fenske to have a different perspective, literally. "I never thought it would be so hard to have to just watch a practice. I understand that it is a privilege. It's hard to watch them on game day with all the fans screaming," he said. However, an injury doesn't necessarily mean free time for the quarterback. He puts in about ten hours of rehab per week. He goes to practices, watches film, and helps the new quarterbacks. "We all help each other out. I help them out with little things like how to read the safeties," he said. Fenske has learned to be patient, not something many athletes are accustomed to doing. That may ultimately be his best weapon. The fifth century poem 'Psychomachia' or 'Battle for the Soul' by the Latin poet Prudentius is an allegorical work that describes virtues fighting for control of man's soul. In the poem, patience comes off like a quality offensive lineman. "No virtue leaps into the hazards of battle save that virtue be with her, for she is ineffectual whom patience does not strengthen," goes section 170 of the poem. Patience faces off against anger, and anger ends up shooting himself in the foot while patience remains steadfast. Fenske didn't seem to have any hint of anger in voice when I spoke with him. He seemed driven. 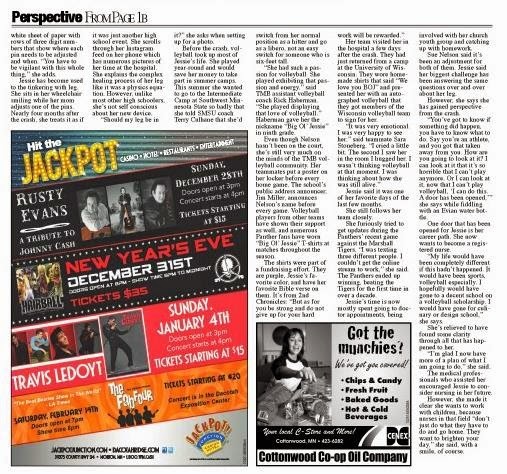 "I'm looking at everything from a different point of view. I'm focusing on getting healthy. It's almost like starting back at point A," he said. Coming back stronger next year for his senior season is the main goal for Fenske. His coaches told him that many players have returned from similar injuries and have gone on to have stellar comeback seasons. "Madness dies of self enmity. In her fury she slays herself." Fifth century wisdom for Fenske's 2015 comeback. MARSHALL- It started with a cough. 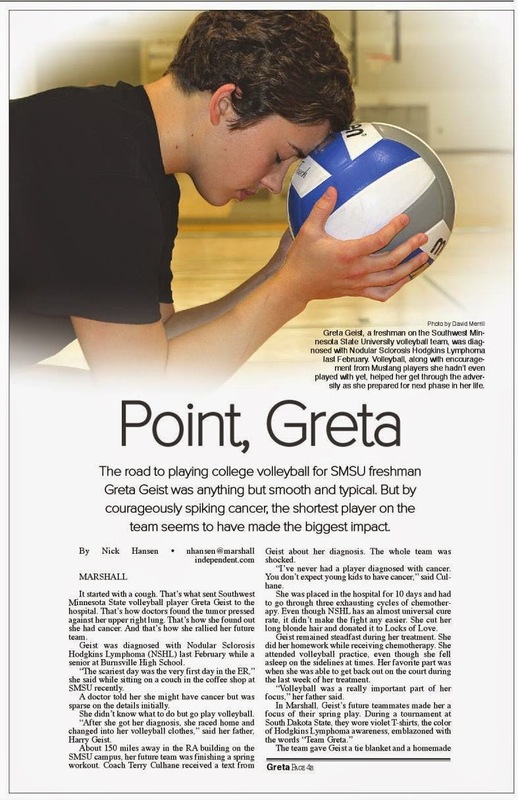 That's what sent Southwest Minnesota State volleyball player Greta Geist to the hospital. That's how doctors found the tumor pressed against her upper right lung. That's how she found out she had cancer. And that's how she rallied her future team. Geist was diagnosed with Nodular Sclorosis Hodgkins Lymphoma (NSHL) last February while a senior at Burnsville High School. "The scariest day was the very first day in the ER," she said while sitting on a couch in the coffee shop at SMSU recently. A doctor told her she might have cancer but was sparse on the details initially. She didn't know what to do but go play volleyball. "After she got her diagnosis, she raced home and changed into her volleyball clothes," said her father, Harry Geist. About 150 miles away in the RA building on the SMSU campus, her future team was finishing a spring workout. Coach Terry Culhane received a text from Geist about her diagnosis. The whole team was shocked. "I've never had a player diagnosed with cancer. You don't expect young kids to have cancer," said Culhane. She was placed in the hospital for 10 days and had to go through three exhausting cycles of chemotherapy. Even though NSHL has an almost universal cure rate, it didn't make the fight any easier. She cut her long blonde hair and donated it to Locks of Love. Geist remained steadfast during her treatment. She did her homework while receiving chemotherapy. She attended volleyball practice, even though she fell asleep on the sidelines at times. Her favorite part was when she was able to get back out on the court during the last week of her treatment. "Volleyball was a really important part of her focus," her father said. In Marshall, Geist's future teammates made her a focus of their spring play. During a tournament at South Dakota State, they wore violet T-shirts, the color of Hodgkins Lymphoma awareness, emblazoned with the words "Team Greta." The team gave Geist a tie blanket and a homemade poster that had the Mustangs logo on it. They stayed in touch with her via text messages and social media. They hadn't even played with her yet. But that didn't matter to the team. "It's a future teammate," said SMSU volleyball player Emilee Gutzmer. Gutzmer and Geist met up for dinner over spring break near the Twin Cities. The meeting came in the middle of Geist's chemo treatment, but Gutzmer said Geist was extremely positive. "It looked like nothing had fazed her," said Gutzmer. "She said that she'd be at practice next fall." 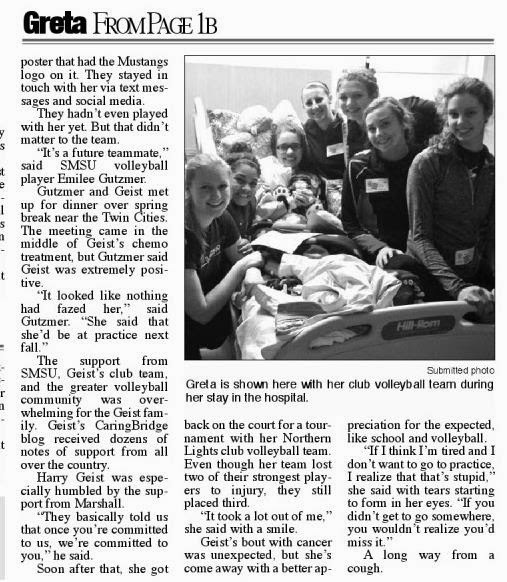 The support from SMSU, Geist's club team, and the greater volleyball community was overwhelming for the Geist family. Geist's CaringBridge blog received dozens of notes of support from all over the country. Harry Geist was especially humbled by the support from Marshall. "They basically told us that once you're committed to us, we're committed to you," he said. Soon after that, she got back on the court for a tournament with her Northern Lights club volleyball team. Even though her team lost two of their strongest players to injury, they still placed third. "It took a lot out of me," she said with a smile. Geist's bout with cancer was unexpected, but she's come away with a better appreciation for the expected, like school and volleyball. "If I think I'm tired and I don't want to go to practice, I realize that that's stupid," she said with tears starting to form in her eyes. "If you didn't get to go somewhere, you wouldn't realize you'd miss it." A long way from a cough.